Sometimes, the chance, the hazard or maybe just the destiny, place you at the right place at the right moment. 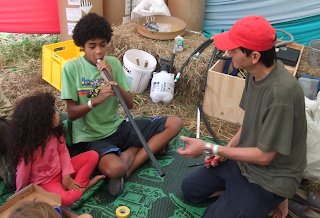 This day at Womad (World’s festival), we met Roy Glass, who is living in Wellington and who is a member of Funky Junk. To know more about Funky Junk and to continue discovering about our perfect green world, we decide to meet him in Wellington when we were there. Hello Roy, can you introduce yourself? I am 55 year old and have lived in Wellington for over 30 years. 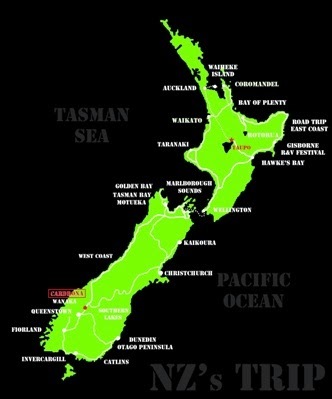 I grew up in a city called Wanganui, 3 hours north of Wellington. I first arrived in Wellington to start the University around 1979. After that I went to London (like a lot of Kiwis) to work. In London, I was working for a big company. After few years in London, I decided to come back in Wellington, and I am now working for the Government/Parliament as an auditor. I am married with 2 sons. In 2008 I had a stroke which changed a lot of things in my way of thinking/doing. I always loved the Music, and a lot of things changed in 2009. I had the opportunity to go with my son and his barbershop chorus to Los Angeles. And on my last day, I was spending some time at Venice Beach, and saw some guys pounding out some fantastic rhythms on drums and other percussion instruments. At that time I decided to get involved in percussion when I returned to New Zealand. So when I came back from the States, I was put in contact with a Brazilian guy called Jose Leal to take some drumming lessons. Thanks to him, I was introduce to Funky Junk. Can you please tell me more about Funky Junk? Funky Junk is a non profitable organization, initially created by Jose Leal together with members of the Wellington Batucada –a Wellington based Brazilian drumming group- sometime in 2007. The initial concept was to create music using re-cycled materials such as old barrels, old cooking pots and pans. In fact anything flat made a suitable noise. The other current members of Funky Junk are Carin Sundstedt, Angie Gooch, Hazel Leader,Cindy Thompson, Gordon Cessford, Cillian Walker, Simon Grove and me. It is fair to say that most of our creative ideas come from Simon Grove, especially for instrument making. 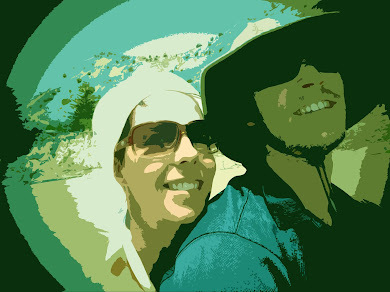 Simon got many of his idea when he was living in Perth, Australia few years ago. Apart from performing and providing entertainment, Funky Junk had some deeper philosophies to do with raising an awareness of environmental issues around recycling waste in educating people on practical ways of recycling waste. We try to show to the children during some workshops that the junk they throw away is not necessarily bad, but can be used for other different things. They just need to create it. We bring them the junk items, and we let them make their own instruments. It is a brilliant opportunity for the kids to learn and do some new things with their hands. They love that because they are really involved in the project. Towards the ends of 2010, we formalized the structure of Funky Junk by making it into a registered charity. This made it easier for Funky Junk to apply for grant funding. In becoming a charity, we formalized our objectives being Environment-Education-Entertainment. What is your involvement with Funky Junk? I have experience in the paperwork side of things (such as setting up organizations). So in that way, I have helped Funky Junk for having a formal structure, assists in obtaining grants from granting organization for example. And I get into trouble with the neighbors because Funky Junk practices in my garage at homeJ. When and where can we see the Funky Junk? Funky Junk performs regularly to different audiences as, for a better description, “street performers”. Moreover, in some official events, like we did in Womad festival. We are officially involved in the festival and we do some workshops for the children. 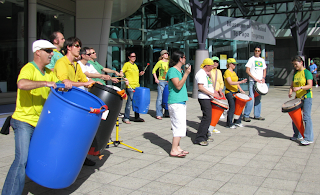 We also participate to some events in Wellington and for example, we have also been able to do 2 performances for the Rugby World cup in 2011 in Wellington which has been very good for us. 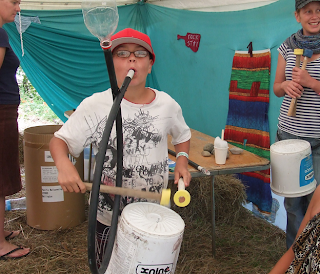 In Womad, we have seen some strange musicians, playing with some junk instruments and completely dressed up with some recycling products. Was the Funky Junk? No, they were the members of the Junk Monsters. Simon Grove is also involved in the Junk Monsters. All the instruments that they use are taken from the same idea. During Womad, Junk Monsters set up played some music, and the Funky Junk was there to do some workshops with the children. How do collect all the junks? To make the drums, we use some old plastic paint barrels. We recycle them from a painting factory. To make the belts, we use old bicycle tubes. We get them from the bicycle shops. We also use some drift wood from the beach and rubber from old body boards that we find in the recycling centers for drum beaters. We exclusively use junk to make our instruments. We always keep our eyes open for useful junk, and it works pretty well. 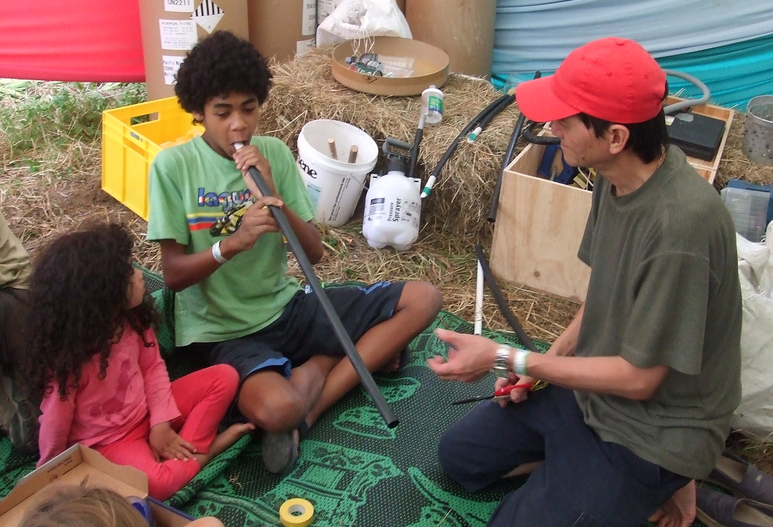 In the case of Womad, how did you become involved initially? And how does it work usually? Gordon (FJ member) was contact by the Womad organization 3 years ago. And thanks to that, we have been involved for the last 3 years. The music community in Wellington is a small world. Everybody knows everybody and thanks to that we are regularly involved in events. Funky Junk has reached a point where it needs new people, new ideas, and lots of new motivation to continue doing what we do. Thanks you Roy, and sorry but we are not available for the moment, we have to continue our NZ trip. But anyway, see you tomorrow for some live music in the fabulous city of Wellington. Would you be interested by joining Funky Junk, they are looking for some new brains. Or maybe it just gave you the idea to create your own recycling instruments… Who knows? Good job guys ! Another one beautiful meeting. No picture ? it's a shame. I try to listen some Roy's music on Spotify or Deezer.Let's continue.